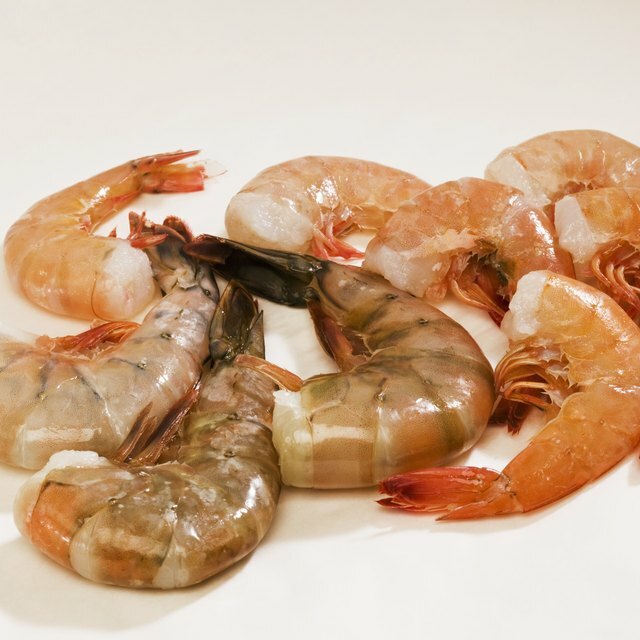 Can You Refreeze Shrimp That Has Been Previously Thawed? Twice-thawed shrimp are best in soups and sauces, which hides any loss of quality. 1 Can You Cook Shrimp Without Thawing Them? 2 Can You Thaw & Refreeze Clams? Shrimp are about as versatile as any seafood could possibly be. They can be eaten hot or cold, grilled or poached, as a colorful garnish or as the main meal themselves. You can buy them fresh, frozen or "previously frozen" in most stores, which raises a question about food safety. Refreezing thawed seafood certainly poses a potential problem, but you can do it safely if you understand and follow the proper steps. The food safety pamphlets you see online or at your supermarket place a lot of emphasis on the food safety "danger zone." That falls between 40 and 140 degrees Fahrenheit, the 100-degree temperature range that favors bacterial activity. At lower temperatures, bacteria struggle to reproduce, while at higher temperatures they're occupied with simple survival. To ensure your shrimp are safe to refreeze, you need to minimize the time they spend in that range of temperatures. Ideally you'd keep them on ice or in a cooler while driving home, then refrigerate them immediately. If you buy the shrimp frozen and thaw them yourself, the thawing method you choose becomes critical. Shrimp are relatively small, and can be thawed quickly. Some cooks leave them on the counter, while others thaw them in cold water or even in the microwave. If you want the option of refreezing, you can't do any of those things. Countertop thawing is never safe, and if you use the water or microwave methods, you'll need to cook the shrimp on the same day. The only safe way to thaw shrimp is in your refrigerator, which takes 12 to 24 hours of advance planning. Your fridge maintains a safe temperature below 40 F -- that's what it's for -- so your shrimp never reach an unsafe temperature as they thaw. The refrigerator life of fresh or thawed shrimp is short, only one to two days, so the less time they're thawed, the better. As soon as you decide to put off cooking them, or as soon as you bring thawed shrimp home from the store, pop them into the freezer. Make a note on the package, so you'll know that they've already been thawed at least once. The next time they come out of your freezer, they'll need to be either used or discarded, in part to avoid food safety issues and in part because of quality concerns. Like any other muscle tissue, a shrimp's body contains a high percentage of water. When you freeze them, the water filling a shrimp's muscle cells expands exactly like an ice cube in its tray. When that happens, some of the cell walls rupture under the strain of the expanding ice crystals. After they're thawed, some of the moisture will leak from those shrimp, leaving them drier and less flavorful than fresh or once-thawed shrimp. In extreme cases, the shrimp's flesh can become mushy, losing the distinctive firmness that's part of their appeal. Whenever possible, use twice-thawed shrimp in soups, dips, sauces and casseroles to conceal these shortcomings.